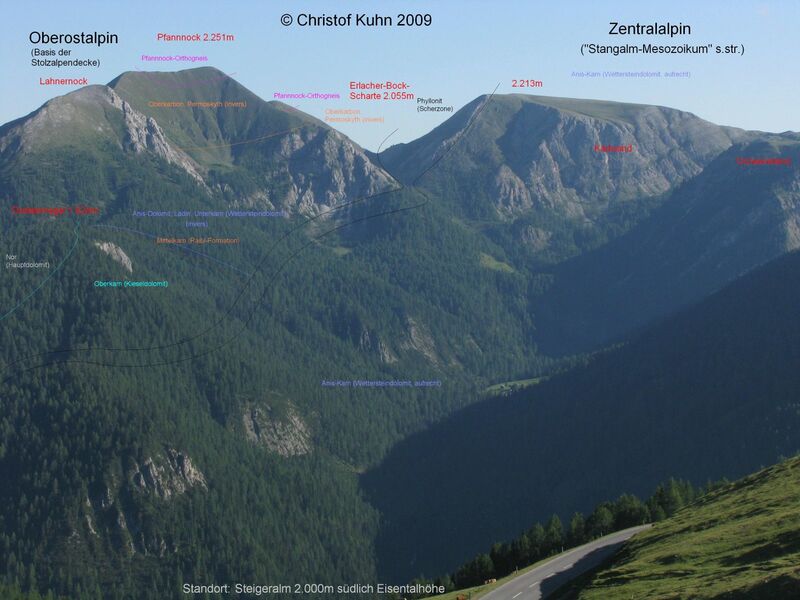 Also see Introduction to the geological zones of Austria! Unfortunately, quite a few texts about the structure of the Alps miss the fact that there are several different outcrops of Alpine rocks within the Tertiary basins "outside" the Alps. The largest and most famous of them are the Güns Mountains (slates of the Southern Penninic). This rigde continues to the S and then W in a larg bend (the ridge frequently dips below the surface): Next to the Güns Mountains, there is an outcrop at Burg - Eisenberg, composed of Penninic rocks, overlain tectonically by Devonian sediments (equivalents of the Paleozoic of Graz). W of Güssing, Devonian slates and limestones can be found as well, and near St.Anna/Aigen (in the vicinity of Bad Gleichenberg), there is a hill built of phyllites of the Pal. of Graz. Near Leibnitz and in Sausal, finally, there are phyllites again, with a porphyroide complex at the Mandl Hill (equivalent of the Blasseneck Porphyroid of the Greywacke Zone). Another ridge lies further to the SE: it starts N of Lake Balaton, passes Budapest and merges with the Carpathians. In the W (Bákony Wood), it consists of Triassic limestones, whereas further in the E, Liassic Limestones and Upper Paleozoic rocks predominate. The existence of Gosau Formation (Upper Cretaceous) at the N rim of the Pal. of Graz is considered as evidence that the Pal. was thrust N over great distances, since the Gosau sediments lack components of the Middle Austroalpine, which underlies them. The Central Gneiss of the High Tauern Range is commonly considered to be part of the Venediger Nappe (Penninic) and comprises an Upper Carboniferous (Variscian) intrusion into the "Old Roof" (compare the Weinsberg Granite of the Bohemian Massif - same age!). Other Authors (FUCHS, W. (1981)) consider the Venediger Nappe as Helveticum (compare the Aare and Gotthard Granites and the Mont Blanc Massif!). A narrow area of Upper Carboniferous to Upper Triassic sediments is located N of Radenthein (Carinthia). At the Pfannock Peak, the Paleozoic of the Gurk Valley was thrust over it (recumbent fold), so that most of the sediments (Main Dolomite Facies) lie inversely above a shear zone and the Middle (Central) Austroalpine Nappe. The Austroalpine (Lower Bayuvaricum Nappe) and Penninic (Flysch Zone) Nappes tore away several rock bodies of the underlying massif as they were thrust above the Helveticum. This causes a narrow zone of sheared Helvetic and Ultrahelvetic rocks ("Klippen Zone") that crop out as a W-E striking line between the Austroalpine (Northern Calcareous Alps) and Flysch Nappes. Due to great tectonic movements, the original thickness and the composing rocks are hard to define. The predominant rocks are Jurassic limestones and Klippen Cover rocks (red to green shales and marls of the Cretaceous). There is a remarkable occurrence of an Ophiolite body (probably of Penninic origin), which is situated in Hasel Valley (E of Waidhofen at Ybbs river and Ybbsitz), and several basement rock bodies from the subducted parts of the Bohemian Massif can be found there too. The most popular of them is a granite block located in the Pech Valley N Großraming, that serves as a memorial for the famous geologist L.v.Buch. Further occurrences are in Schaitten at the Stein Creek (NE of Gresten), and in Glosbach (between Mank and Kirchberg at river Pielach). Occasional basement rocks are also reported within the Klippen Zone of the Vienna Wood (between the Laab and Greifenstein Flysch Nappes), particularly leading from N of Schöpfl Hill to the Hengstl Saddle. As mentioned above, there are several remarkable occurrences of Gosau Formation (Upper Cretaceous to Lower Tertiary) in the Graz Highlands. The largest of them is situated around Kainach (N of Voitsberg). Its lower strata consists of a base conglomerate, cemented with red material. Peculiarly, the components are mostly of South Alpine origin (Permian and Triassic limestones and Lower Paleozoic low-stage metamorphites) - rocks from the underlying Paleozoic of Graz are rare and components of the Middle Austroalpine basement (in the very vicinity of Voitsberg) are missing completely. This means that the Paleozoic of Graz might have been thrust N over great distances. Why smaller Gosau occurrences at the N rim of the Pal. of Graz (NE of Mixnitz, near Bärenschütz Gorge, SW of Laufnitzdorf at river Mur and further to the NE, at the N slope of Mount Schiffall - the latter occurrence was even thrust under the Paleozoic Hochlantsch Limestone of Mount Schiffall during the Tertiary!) lack components of the Pal. of Graz at all remains unsolved yet. Another interesting feature of the Gosau Formation at Bärenschütz is the occurrence of the famous K-T boundary, containing the Iridium anomaly of the Chicxulub meteorite impact, which caused (or at least completed) the extinction of thousands of species, among them the dinosaurs (according to ALVAREZ). Serpentinite is mostly formed when ultrabasic magmatic rocks (e.g. upper mantle rocks such as pyroxenites) become metamorphous within an orogen. There are few occurrences of potential basic rocks in Austria, and the number of metamorphous basic rocks is even smaller. That is why serpentinites are quite rare in Austria. N of Neunkirchen, there are two small outcrops of altered Middle Triassic volcanics. One of them is located in Unterhöflein (300 m NO of Kirchbühel Hill) and the other is situated further to the E at the Roman Road (NE of Willendorf). W of Neunkirchen, parts of an amphibolite formation of the Greywacke Zone (Kaintaleck-Nappe betwenn the Noric and Silbersberg Nappes) were altered into Serpentinite. The outcrop is in the Saubach Valley E of Bürg (W of Ternitz). Dunkelstein Wood: see Bohemian Massif. The Muride System contains a Paleozoic suture where the "Speik Complex" (mainly in the Gleinalm and Hochalm mountains) was thrust over the "Volcanogenic Complex" (Seckauer Tauern range). Surrounded by gabbroide amphibolites, serpentinised dunites can be found at the N slope of Mount Hochgrößen SW of Rottenmann (easily visible in a satellite image!) and at Lärch Hill and W of Kreuz Hill SW of Trieben). A large bronzitite and harzburgite complex (altered peridotites) is located at Kraubath at river Mur (there is a large quarry in Preg), and smaller ones are situated S of Seckau (Kalvarienberg), on Harter Hill N of Traföß (SE of Bruck at river Mur) and N of St.Jakob in Breitenau). Several Penninic ophiolites reach the surface in the Window of Rechnitz. Most of the ophiolite rocks are serpentinised and comprise Austria's most important deposit of gem-quality serpentine. There is one occurrence in the area of Bernstein - Kienberg - Steinstückl - Ochsenriegl (S of Redlschlag, S of Kogl), and two smaller ones are located on Kanitzriegl Hill (E of Bernstein) and in the Güns Mountains at Little Plischa Mountain. Around Heiligenblut, penninic ophiolites of the S limb of the Glockner Nappe metamorphised into serpentinites, and actinolite, chlorite and talcum schists.